THE GROUP REPRESENTING family-owned grocers and supermarkets has stepped up its fight against the German discounters as the cut-price chains continue their spread across Ireland. A Fora analysis of An Bord Pleanála documents has found that the Retail Grocery Dairy & Allied Trades Association (RGDATA) has tried to block the construction of 22 Aldi or Lidl supermarkets, as well as five unbranded ‘discount stores’, in the past decade. The majority of the appeals to the planning board were made in the last five years. Since the beginning of 2017 alone, RGDATA – which represents 4,000 stores around the country – has been successful in stalling the construction of two Lidls and two Aldis. A fortnight ago, it put the brakes on an Aldi supermarket in Graiguenamanagh, County Kilkenny. Earlier last month, it appealed Cork County Council’s decision to grant planning permission for Lidl to demolish its existing Mitchelstown store and replace it with a larger one. In January, the group tried to block planning permission for a Lidl in Drogheda as well as an Aldi in Laytown, County Meath. The outcomes of those cases will be published later this year. During the 10-year period, RGDATA successfully appealed against four Aldis and three Lidls, while three of the five unbranded discount stores were refused planning permission. The grounds of appeal in each case against the German discounters were largely based on concerns that the stores would take business away from town centres. In the case of one Lidl store planned for Drogheda, RGDATA director Tara Buckley told An Bord Pleanála that the scale and location of the project would “draw trade from a wider catchment area and have a significant impact on the vitality and viability of Drogheda town centre”. Buckley told Fora in a statement that the group is “a supporter of the government’s retail planning guidelines which are specifically focused on ensuring sustainable retail development”. However, Lidl’s property director, Alan Barry, pointed to the fact that many RGDATA members came under the umbrella of the Musgrave Group, the company behind SuperValu, Centra, Daybreak and a number of other supermarket brands. In a statement to Fora, Barry said it was “frustrating” that RGDATA has become a “serial objector” to Lidl’s expansion plans. “Regardless of numerous attempts by RGDATA … we remain committed to the Irish market,” he said. In total, RGDATA made 61 appeals to the planning board between 6 January 2006 and 17 March 2017. As well as opposing new builds by Lidl and Aldi, the group fought against the construction of nine Tesco stores during that period and was successful twice. The remaining appeals to the planning board were in relation to other developments such as shopping centres and warehouses. SuperValu and the four other supermarket ‘multiples’ – Tesco, Dunnes and the two German retailers – have been locked in a tight battle for market share over more than a decade. 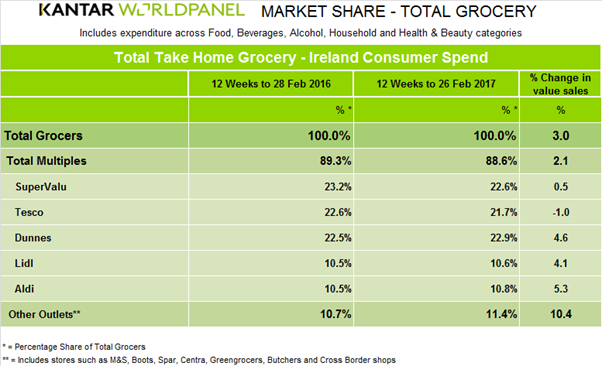 The latest figures from analysts Kantar Worldpanel Ireland show SuperValu is currently the second-top chain for total consumer spending behind Dunnes, but both Lidl and Aldi have been taking large swathes of market share in recent years. The two German chains together command 21.4% of the market – just behind SuperValu’s 22.9% share. Kantar bunches data on independent grocers in with outlets like Marks & Spencer, Spar and Centra. That segment accounts for a combined 11.4% if the Irish grocery market.